We hear so many brilliant stories of the wonderful people we work with we want to tell you about them all! From individual producers in remote locations to co-operatives that are helping to transform whole countries, there is a story to go with the product. 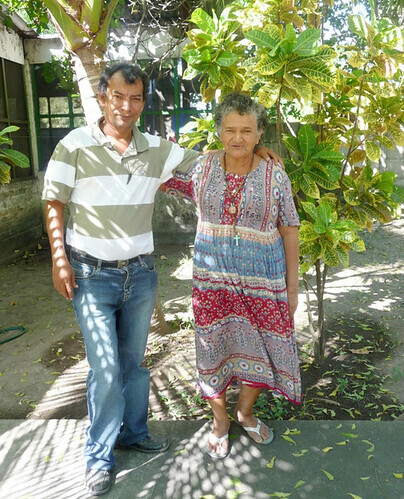 So make yourself a cuppa and grab a Fairtrade biscuit, sit back and read the amazing story of Ines, her involvement in the El Salvador civil war and her new life as a Cashew nut farmer. Ines has seen a lot in her 63 years . She's now part of a co-operative called Aprainores, growing Cashew nuts for Equal Exchange,but when she was younger she played a key role in the El Salvador civil war. Working for the guerrilla revolutionary party from 1973 – 1992, Ines travelled all over El Salvador carrying information and money to help the revolutionaries. This work was so dangerous that she had to carry false documents and even put her six children into the care of a Red Cross refuge to try and keep them safe. On one occasion 5 revolutionary party members Ines was travelling with were caught and executed by government forces. It is estimated that over 75,000 people lost their lives during the war. Ines herself lost 4 of her 6 children during the conflict. This prolonged period of instability meant that come the end of the war in 1992 the country was struggling to support itself and needed people to bring stability and organisation. Ines, having fought so hard, was determined to continue helping her local community to build on its newfound freedom. She set about organising and promoting a democratic structure that would help improve the lives of her friends and the local community who were so badly affected by the war. As part of the peace agreement land was given back to families so that they could support and feed themselves. With the plot that Ines and her two remaining sons were given she set up a Cashew nut farm. This really helped them all feel like they were living a "normal" life again, as well as giving them an income that was so badly needed. Ines soon joined Aprainores, a modest, local Fairtrade certified group of around 60 farmers who grow and process cashew nuts using profits to help improve their local community. Not only does Aprainores provide people like Ines with a fair price for their crop but it has also educated its members to farm sustainably and organically. This is great news for both the farmers (who don't need to buy expensive fertilisers any more) and the planet. Not only that, but Aprainores also employs 40-70 seasonal workers from the local community to process the nuts. This is brilliant as it means the wider local community (not just the farmers) can benefit from the harvest. The cashew nut farmers live in a remote and isolated area of El Salvador, which could make it very difficult for the farmers to sell their nuts without travelling long distances. But thanks to Equal Exchange, which has formed a brilliant trade link with Aprainores, all the farmers get a fair price for their crop. The income they receive from Equal Exchange helps the producers gain a financial security they wouldn't have otherwise and has helped improve their standard of living. It has taken a while to get there but over the last few years the co-operative has been going so well that they have been able to collectively buy more farmland to grow more nuts. The factory now has a canteen for the workers along with new solar panels helping to reduce their electricity costs and help the environment. They have also bought a truck to help farmers transport their crop from their farms to the factory. So although life is still hard for Ines and the other Cashew producers they are proud to be able to support themselves and supply a healthy and sustainable product to Equal Exchange. All they ask is that you continue to support them and their families by buying their delicious Cashew nuts. It's a win-win, you get a Fairtrade, organic and healthy snack and they get to carry on improving their lives and those of their local community. Fairtrade products have amazing stories. Find your story in our Fairtrade section here. Photography kindly supplied by Equal Exchange.